Spider mites are a common enemy of anyone who cares about their landscape plants. Classified as arachnids, these tiny bugs are less than 1/20 inch long when fully mature and look like moving dots to the naked eye. Despite their size, our arborists warn that mites will start being a huge problem for homeowners in the next few weeks. Their ability to rapidly reproduce allows large populations to develop fast and severely harm your plants before you even realize you have a problem. Learn what the signs of spider mites look like, what plants they attack, when they appear, and how to keep them from destroying your property’s landscape. Spider mites reproduce rapidly in hot weather. In our area, we typically see a lot of mite activity from June through September. Spider mites prefer hot, dusty conditions. Plants that are not watered enough and are experiencing drought stress are most susceptible. In addition, our arborists commonly see these mites on junipers, Boxwoods, Cryptomeria, Arborvitae, and Leyland Cypress’. Once one plant is infected, mites can spread throughout your landscape without difficulty. In fact, they use the wind and their webbing to easily sail from one plant to another. 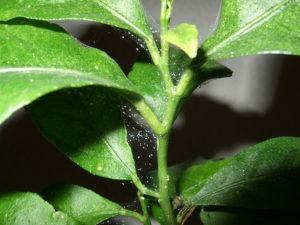 Spider mites cause damage by sucking cell contents from the leaves. You most likely will not notice anything odd when mites are at low populations; however, when they continue to grow to a high population you will start seeing the damage. Injury from spider mites can lead to the death of your plants. When it comes to spider mites you have a couple options. Discuss with you Arborist which approach is best for you and your property. 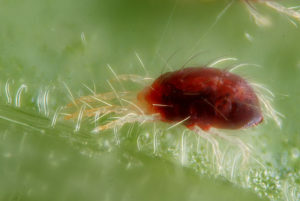 Spider mites have many natural enemies including, predatory mites, minute pirate bugs, and lacewing larvae. We can release these predators on your property in order to control the population of these mites. 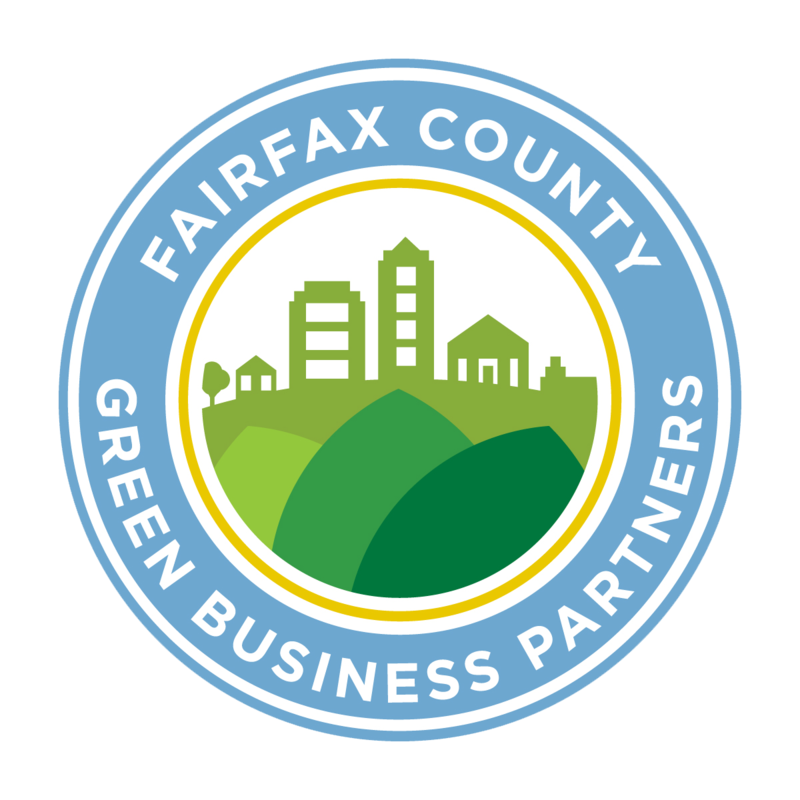 This is a great option for homeowners that are worried about chemicals on their property or have kids that would love to be involved in releasing the bugs on the property. High populations of spider mites can be taken care of by applying a foliar spray specifically for mites. Make sure your trees and shrubs get enough water during the upcoming hot summer days. As discussed above, spider mites like to prey on plants that are suffering from drought stress. 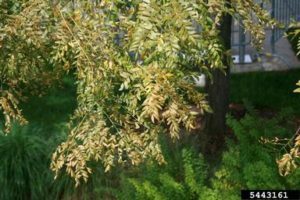 Watering your trees and shrubs correctly and keeping them healthy overall is your first step in combatting spider mites. I’m wondering if you might be able to help me with my dilemma. 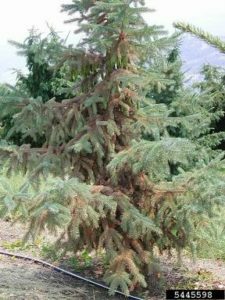 Early 2016 we had our 40+’ Blue spruce pine tree cut down onto our lawn and removed, three days later and ever since I get mite welts on me any time I go out doors, not my husband, just me. All year except the hot summer time. Can you help at all, running out of options and patients.. thanks. Connie H.
Connie, I am so sorry to hear about the problems you are having! Unfortunately, unless the tree is there for us to examine, we are unable to diagnose a Plant Health Care concern. 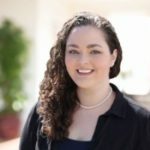 I would advise checking with a pest control company and your health care provider, as they may be more familiar with bug bites and can determine the best solution for you. Best wishes to you!